CPGs who want to make data-driven decisions have probably heard of syndicated data. Syndicated data refers to general market data that isn’t specific to any one client. An aggregation of retailer and product data, syndicated data is generally collected by market research firms and then purchased by businesses who have a vested interest in the market. For CPGs, syndicated data offers a more complete picture of product and retailer performance outside the scope of any one company or brand. For CPG manufacturers, syndicated data can provide a needed window into consumer behavior (one that isn’t linked to specific retailers and their methods of framing data). That said, to tap into the benefits of syndicated data, companies need business intelligence tools that can analyze it. After all, data is only as valuable as the insights it provides; syndicated data is vital context for CPGs and other industries, but it must also be actionable to the business people who drive decisions. 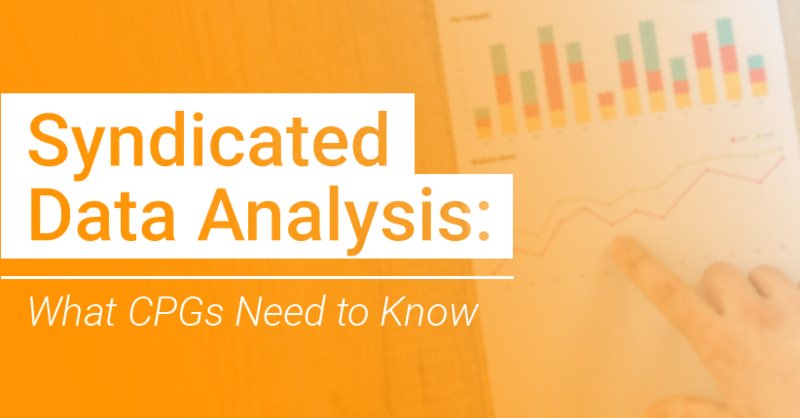 Let’s break down the basics of syndicated data analysis and how your company can get started. Before syndicated data can be analyzed, companies need partnerships with the market research firms who collect it. The largest providers of syndicated retail data are Nielsen and IRI. Retail measurement refers to data collected from stores via POS systems and e-commerce software. Panel data refers to consumer-level data. Data can be collected via surveys or hardware / apps provided to households so that members can scan products as they shop. Nielsen and IRI have partnered to collect panel data through the National Consumer Panel. Together, these data sources can illuminate how shoppers behave, not just what they’re purchasing. Both Nielsen and IRI also offer analytics capabilities and partnerships that allow businesses to dive into the data and build actionable insights. Nielsen created the Connect Partner Network to connect external data and analytics tools to its robust source of shopper information. For example, AnswerRocket connects to Nielsen data, allowing Nielsen customers to analyze market data by asking questions. This streamlined connection is part of Nielsen’s commitment to an open data ecosystem, where intuitive data and analytics tools can seamlessly excavate Nielsen data within a familiar user interface. In the most basic sense, AnswerRocket’s connection with Nielsen allows users to ask a data-based question and receive a visualization and insights in return. Basic questions like “what is market share growth this year” and “brand penetration by state” can be answered in seconds (in this case, answers take the form of natural language insights that accompany a visualization and explain key aspects of the data narrative in plain language). However, these questions are just the surface of what syndicated data analysis can be. One of the biggest benefits of the Connect Partner Network is the ability for analytics platforms to tailor their capabilities to the CPG and retailer industry based upon the vast amounts of data. This means that analytics platforms that leverage AI and machine learning can build algorithms that answer complex questions that CPG professionals ask every day. While most analytics tools are perfectly capable of computing sales figures, the next level analysis of syndicated data looks more like “how did Brand A do last quarter?” with a complete, in-depth answer on the other side. Let’s break this down more by talking through the true potential of syndicated data analysis. Syndicated data provides the context necessary to analyze business data against the broader landscape of the market. If, for example, sales are declining nationwide, a business can approach their own drop as a facet of geographical economic downturn rather than as a failure of their individual campaigns or strategies. Subsequently, a company can then pivot toward opportunities, such as burgeoning international markets, and adjust their strategies to avoid the pitfalls of declining products and categories. With AI, syndicated data analysis can provide these kind of comprehensive, actionable insights based on questions like “why are sales decreasing?”. After all, it takes advanced machine learning algorithms to parse through syndicated data sources and understand how different metrics, like sales value, connect. Machines can illustrate how sales value is impacted by other metrics, like market volume and penetration, and establish a hierarchy of connections until the drivers behind the decline in sales value are fully explained. As such, brand health analysis is far more attainable for business people; syndicated data provides the necessary context to understand brand health within the larger market, and AI performs the complex research that identifies the causes behind a brand’s health. With this information, business people are better positioned to take action than they would be if they were restricted to individual retailer data or if they didn’t have analytics tools with advanced AI capabilities. Brand health is of course important for CPGs, but another benefit of syndicated data is the insight it provides into other major brands and competitors. Where are competitors having success? Which segments are they ignoring? Where can your own company fill in the gaps or overtake the opposition? Syndicated data offers the information necessary to perform this kind of market research and answer these questions. Likewise, AI is well poised to identify the best opportunities for companies who want to best their competitors and gain an edge in the market. Therein lies an enormous opportunity to position a company’s understanding of their own performance within a much larger framework so that business people can act with better information. CPG Analytics: The Definitive Guide. 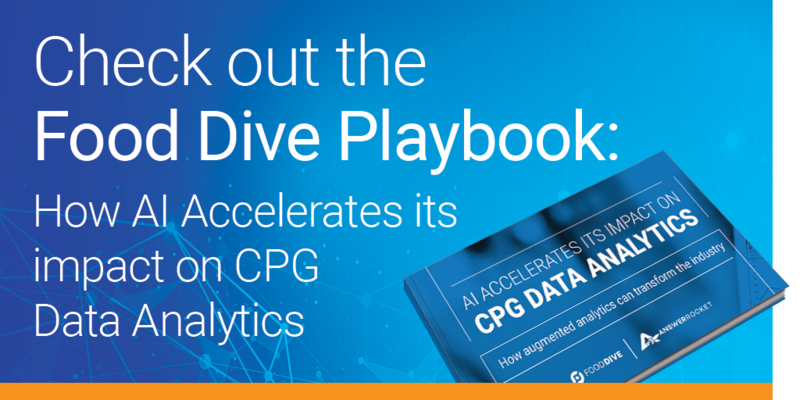 Understand how CPGs can leverage analytics to rock their business strategy. What is Augmented Analytics? Ready to take your knowledge of analytics to the next level? Learn how machine learning and natural language generation combine to automate data insights. How CPG Companies are Driving Meaningful Business Results with AI. This Food Dive playbook breaks down how CPGs can use AI to their advantage. Download this resource for incredible insights.